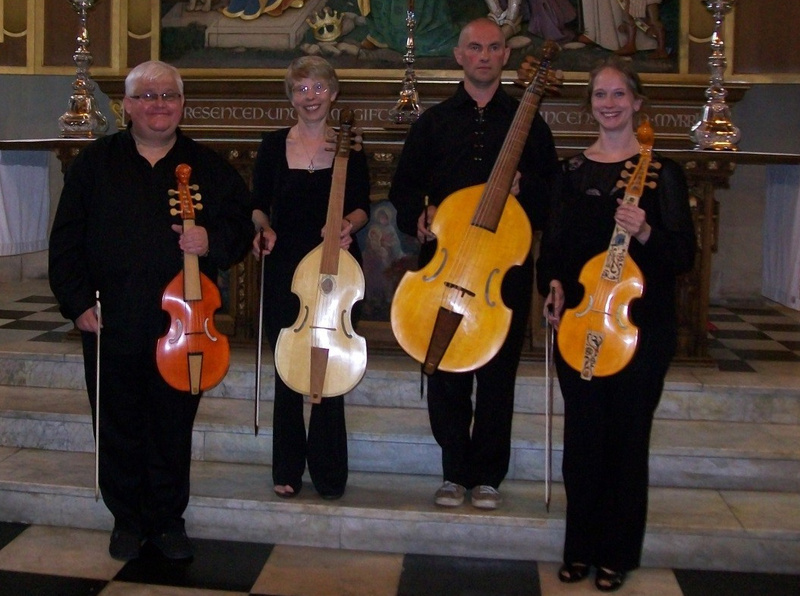 We are a viol consort based in South Wales. Founded in 2007 by Paul Brophy, our performances are based around the consort music of the Renaissance and early Baroque periods, though we have recently added a piece by the modern Estonian composer Arvo Pärt to our repertoire. In addition to consort music for viols only, we like to work with singers and small choirs, and in mixed ensemble with other instruments. Our core players all are involved with music education, or are ex-professional performers. As part of the Summer Serenade lunchtime concert series at All Saints, Oystermouth, Father Paul Brophy and the Cambrian Consort of Viols played a fascinating programme of music from the Jacobean period – by Byrd, Ferabosco, and the little-known Richard Mico, an Englishman of Huguenot background who became a Catholic and whose music was never printed in his lifetime.